All that energy we waste screaming at the screen when our favorite racer gets passed on the final straight is about to be put to good use. It's called "tweet to boost" and I'm not sure if it's brilliant or blasphemy. 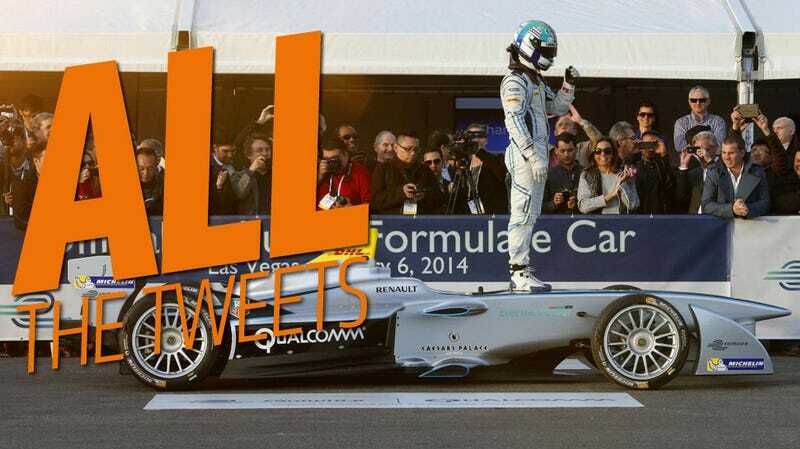 The inaugural season of Formula E kicks off this September in Beijing, and to snag that coveted 20- to 30-something demographic, the organizers are relying heavily on social media. And it's actually going to affect the results. Every Formula E car has an electric motor capable of putting out 200 kW of power (268 hp), but that output is capped at 133 kW (178 hp) throughout the race. However, each team gets two power boosts per race, where the full force of the motor is unleashed in short blasts. But Formula E has added one more boost on the very last lap, and it's based on the number of @-mentions the racer gets on Twitter. So it's like the Teen Choice Awards, but for racing. This is either really clever or will completely hobble a the series before it gets off the ground. Formula E is a global championship, after all, and if a team from a country with, say, 1.3 billion people dominates the Twitter boosts, it could piss off a lot of fans. Formula E boss Alejandro Agag doesn't seem concerned. When asked by Quartz if it will give an unfair advantage to teams in more populous countries, he says, "Oh they will get the votes always. That's fine. It's what we want. They won't win the race only because of that."